Feldstern is a restaurant with a friendly and cozy atmosphere. Close to Heiligengeistfeld and Millerntor-Stadion (check the Millerntor-Stadion article), this restaurant offers lunch and dinner and invites its guests to stay as long as they like. 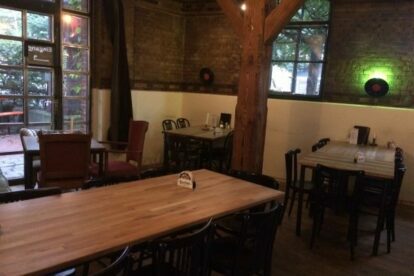 Inside, the Feldstern is equipped with wooden tables and chairs, offering a rustic feeling in which the beer tastes even better! If the weather is nice, there are many beer benches outside for people to enjoy the nice weather and have a beer or some food out in the open. Feldstern offers food for meat-lovers as well as vegans. Their club sandwiches are delicious! They’re my personal favorite and one of the main reasons to always come back to Feldstern. The club sandwiches come with a side salad and yummy French fries. The servings at Feldstern are huge! So don’t even think about ordering an extra serving of fries with your meal – you won’t be able to finish it all. It is a wonderful place to hang out with friends or family, have a cold beer and something to drink, before exploring the other parts of Hamburg!